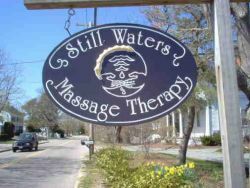 At Still Waters Massage Therapy, now in its 28th year, our team of therapists includes Susan Dexter and Leanne LeBlanc. We are trained in a variety of modalities, and you can click on the "Our Services" page to learn more about the various techniques we use in our work. If you’d like to request an appointment with us, just click on the "Request a Session" page or email us at stlwtr1@gmail.com. We will call you back or email you to confirm the details of your appointment, and also answer any questions you might have. Discount coupons (when available) may be printed from our "Specials" page.